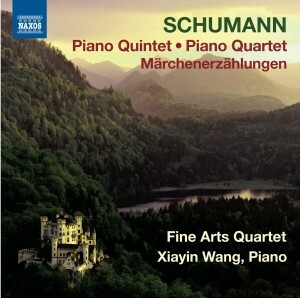 Between 1841 and 1843 Schumann wrote some of his greatest chamber works, among them the Piano Quartet and the Piano Quintet, both in E flat major. Written in an astonishing five-day period, the Quintet displays both the heroic and the lyric impulses in his music, boldness contrasting with songful tenderness, and march themes with lyricism. The Piano Quartet also exudes such qualities, not least in the ravishing slow movement, and the masterful breadth of Schumann’s expression. The four Märchenerzählungen are happy, energetic pieces.